Is your Norton or BSA single or twin dumping all its oil from the tank into the crankcase when you leave it parked? Make sure you are running thick enough oil (50 wt Summer, 40 wt Fall and early Spring) and are parking it on compression (pistons at top of stroke to block off any conrod oilholes). If the problem persists, you can replace your gear type oilpump with an expensive new one, or install one of our Antidrain valves into the feed line from the tank to the oilpump, and get rid of the "oh, no, where did my oil disappear to?" blues. 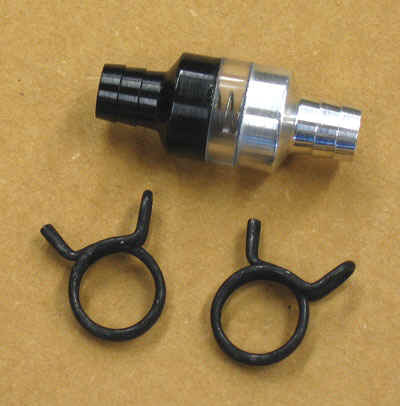 This US made version of our popular alloy 641-21 antidrain valve is manufactured out of virtually unbreakable Lexan, and features a sight window so you can see your oilflow. In stock now for immediate delivery!